Whatever happened to the dinner hour? That time-honored ritual around the table where the family gathers nightly to share what happened that day. Between soccer practice, dance classes and countless other after-school activities, the dinner hour is often replaced with drive-through fly-by’s and pizza delivery. I’ll admit it’s easier for a family to order their own particular meal from a menu–hold the lettuce! But making this type of dinner a habit may encourage a family of picky eaters with, most likely, not-so-healthy eating habits. Having at least a few meals around the table each week coaxed my kids to enjoy the “green things” on their plate, especially if they were hungry enough to initially try them. This recipe proposes a dinner hour truce, satisfying the pickiest of palates. It’s a meal that encourages laughter and sharing around the table. 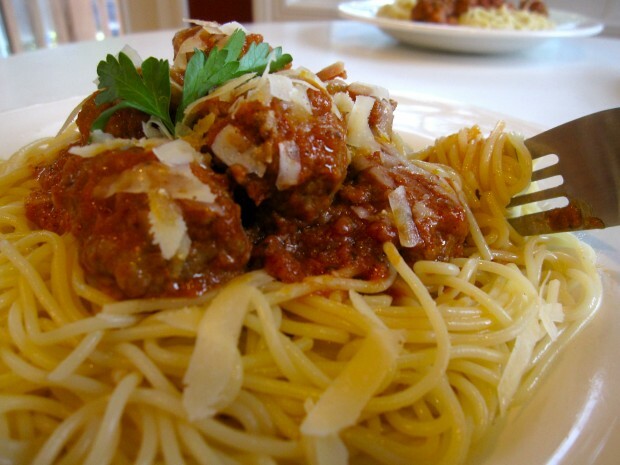 Who can resist a tumble of meatballs served over a tangle of spaghetti? I served this with veggies and ranch dressing dip. Maybe one day I can wean them off the ranch dressing but in the meantime it helps them learn to love the “green things”. Combine the pork, beef, salt and pepper in a large bowl. Add egg, 1 teaspoon garlic, 1/2 cup grated cheese, breadcrumbs and chopped basil. Combine all the ingredients with your hands or with a spoon until just mixed together. 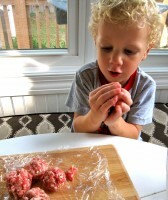 Don’t overwork or the meatballs will be tough. Remove a teaspoon of the mixture and sauté in the skillet or microwave 1 minute or until cooked through. Taste meat and add additional grated cheese, basil, garlic or kosher salt and freshly ground pepper to taste. Form meatballs, about the size of small golfballs. You should have about 25. Over medium heat, heat 36 ounces tomato sauce in a large-lipped large sauté pan. Whisk milk into sauce. Place meatballs into tomato sauce and let simmer, covered, 10 minutes. Add additional tomato sauce to the pan if you desire. Turn meatballs and let simmer an additional 10 minutes or until thoroughly cooked. While the meatballs are simmering, cook the spaghetti in the boiling water according to package instructions. Drain and place spaghetti onto a large serving platter or individual plates. Ladle meatballs and sauce over pasta, garnish with basil leaves and serve, passing extra Parmesan for grating.